Sep. 6, 2013 6:00 p.m. The poster boasted, “Join us for a fun-filled day at our 37th Annual Lakedell Country Fair, August 31, Alberta’s Largest One-Day Fair!” Judging by the number of vehicles that filled a large field north of the fairgrounds, the claim is most likely true. The Fair is big but it isn’t ‘big and commercial’. It’s more of a ‘heart and soul’ community style of event. A visit to Lakedell’s Country Fair is an opportunity to witness how a small rural community filled with enthusiastic volunteers can host a one day event with literally something for everyone. And, at affordable prices. Advance tickets to the event cost a mere $5.00 for a full day of activities, ($10.00 at the gate and free for 12 and under). It was quite obvious the event started well before the actual day. Hundreds of volunteer hours were required to prepare for, and host an event of this size. 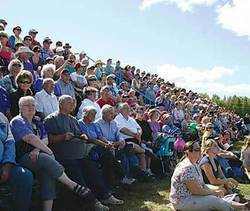 The expanded trade show, parade, Lions Club breakfast, bench show, horse shows, heavy horse pulling competition, miniature horse demonstration, talent show, old time fiddle jamboree, cattle sorting, Pigeon Lake Fire Department display and the Strathcona Mounted Troops Musical Ride and more. For the kids and youth there was a pet show, calf scramble, cow milking display, small train ride, bungee jumping, bouncy house and many other attractions. The day ended with a traditional country style steak BBQ and dance. The Lakedell Fair is unique as it is a fusion of rural and urban. Wandering around the grounds were rural ‘locals’ or agricultural producers (farmers and ranchers) recognized by their blue jeans, western shirts, ball caps or cowboy hats and western boots. Circulating among the locals were the urban or ‘lake people’ attired in shorts, loose fitting shirts and flip flops or in some cases ‘one day of western wear’ attire. Founded in 1973, the Lakedell Ag Society’s membership was mostly comprised of people with an agricultural background and provided agricultural based programs and services. However, over the years more and more young families and retirees were attracted to the region and need for expanded or new programs and services evolved. The Society adapted and has progressed to be more diverse in its programming and events to accommodate this change. The Lakedell Ag. Society continues to be the centre of activities for Westerose and surrounding communities. They operate a multi-use facility comprised of a large heated indoor riding arena, 2 outdoor arenas, a large main hall, small hall, 2 sheet curling rink, large modern playground and bocce & horse shoe pits. In addition to the Country Fair, the Society hosts other events such as a Christmas Fair, Farmers Market every Friday from 4 pm to 7 pm throughout the summer, Women’s Conference, Youth Riding Camp, Bullridin’ & Bootscootin’ and a Big Screen Grey Cup Party. The Society is continually improving and growing their facilities, equipment and programs and services. They are also always looking for new and more volunteers to assist with their various events. But with the Society, volunteering is viewed as more than just that. At Lakedell, volunteering becomes ‘community’ and offered as a great way to socialize with existing friends and meet new ones. MP Blaine Calkins described it best during a visit to the Lakedell Ag Society in the spring of 2013 to announce a funding grant. “It’s absolutely fantastic to see this particular facility (Lakedell Ag Society Hall, arena, curling rink and Hall B) as it’s the centre of the community and the lifeblood of the surrounding area as far as keeping the community together. So, for small rural communities and the rural way of life, we need to pay attention and focus on the community and make sure we have facilities such as this. In addition to the larger centres such as Wetaskiwin, Lacombe and Ponoka we also need to pay attention to facilities in the countryside. With more than 24 events and other attractions, the Lakedell Fair has enjoyable entertainment and competition for everyone from tiny children to seniors. There is so much going on that it is difficult for any one person to take it all in. This year, the weather was superb, sunny but not too hot to be truly enjoyable, which helped attract the very large turn-out on Saturday, August 31. Some events are staples, enjoyed year after year. Some change after a few years to provide variety. Some are special events that come to Lakedell every few years. One of those special events this year was the Musical Ride by the Lord Strathcona Mounted Troops. The Lakedell Agricultural Society and all its volunteers are to be congratulated and commended for their excellent realization of their great vision for this Fair.The Don Fiveland Memorial Old Time Fiddlers' Jamboree acquired the addition to its name this year in honour of Don Fiveland, founder of the jamboree and long-time active supporter of the Lakedell Ag Society.